This is one of the great views along the Mist Trail - or in all of Yosemite, for that matter - featuring, from right to left, Nevada Fall, Liberty Cap, and the back of Half Dome. 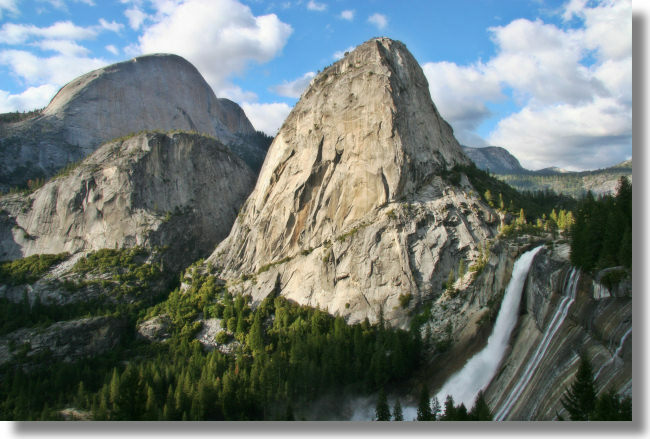 To reach this vantage point, climb the Mist Trail to the top of Nevada Fall, and then cross the creek above the falls and take the John Muir route back to Yosemite Valley; this spot is close to the beginning of the trail. This view is by far the highlight of the Muir section of the Mist Trail, so if you're out to maximize your scenery, you might prefer to turn back here and head back down to Yosemite Valley via the trail that shadows Nevada and Vernal Falls.